Bridgewater, NJ- The Somerset Patriots have won the Liberty Division First Half Championship and clinched a playoff berth. The team has placed Playoff Tickets on sale for the Liberty Division Series to be played at TD Bank Ballpark. Games 1 and 2 of the Liberty Division Championship Series will take place on the road in Long Island versus the Ducks on Wednesday, September 19th and Thursday, September 20th. Game 3 will take place at TD Bank Ballpark on Friday, September 21st at 7:05 pm and will feature a Post Game Fireworks Show. Games 4 and 5 are both if necessary games and will be played at TD Bank Ballpark on Saturday, September 22nd at 7:05 pm and Sunday, September 23rd at 5:05 pm. Should the Somerset Patriots advance to the Championship Series, then Games 1 and 2 will be played on the road in either Sugar Land, Texas or Lancaster, Pennsylvania on Tuesday, September 25th and Wednesday, September 26th. Games 3 will take place at TD Bank Ballpark on Friday, September 28th at 7:05 pm. Games 4 and 5 (both if necessary) will be at TD Bank Ballpark on Saturday, September 29th at 7:05 pm and Sunday, September 30th at 5:05 pm. Somerset Patriots Season Ticket Holders will receive their complimentary tickets to enjoy all the potential playoff games at TD Bank Ballpark. Playoff Tickets prices are $11.50 for Upper Box Tickets, $12.50 for Field Box Tickets, and $14.50 for Premium Field Box Tickets. All prices are the same as the regular season. Fans that purchase tickets for Game 3 of the Division Championship Series scheduled for Friday, September 21st will also receive tickets for Games 4 and 5 if necessary for no additional cost. 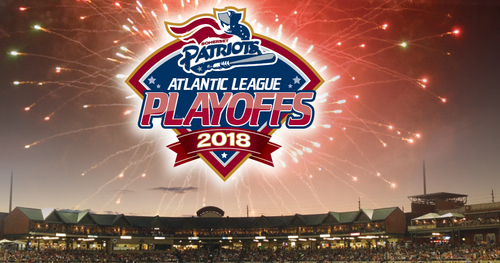 The Somerset Patriots are also offering Playoff Group Outings with special discounted tickets for groups of 30 or more and the opportunity to book events in the Picnic Area, Party Deck, Suites, or Diamond Club. Call a Somerset Patriots Group Representative at (908) 252-0700 to book a Playoff Group Event.